A great view of Baba, Dolgi hrbet, Ledine hut and the valley underneath opens up at the hut. 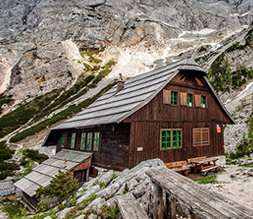 Several trails lead to Češka koča mountain hut. All are well-marked and secured on exposed parts. A great view of Baba, Dolgi hrbet, Ledine hut and the valley underneath opens up at the hut. Češka koča is opened on weekends from mid-May till the end of June and every day from the end of June till the end of September. Access: Jezersko – lake Planšarsko jezero – Tourist farm Ancel – cargo cableway (parking) – Češka koča (1 h).